So, I did it! I managed to schlep all 4 of us from Boston to New York City and back. And we made it. But for as exhausting as it was at times, it was totally worth it. I'd do it again in a heartbeat. 1. That my offspring ask lots of questions. Now, I know that all children ask questions, but my children are particularly adept at asking questions that I DO NOT KNOW THE ANSWER TO. Such as: Why is the train late? 1a. They also constantly asked utterly ridiculous questions such as: So what does 5 more minutes mean? 2. That no matter what city or state we are in, boys will be boys. Package check! Yep, it's still there! 3. That I still haven't lost my mad soccer skillz. (I played all through childhood, high school, and then in college.) 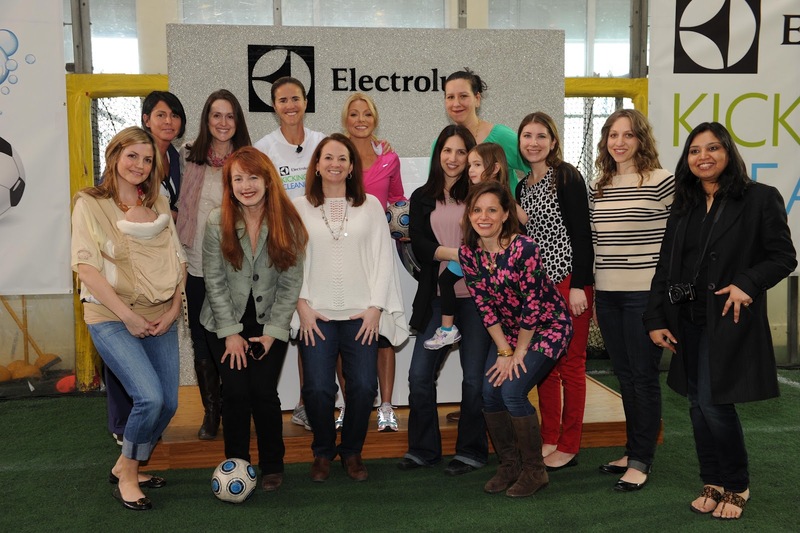 Brandi Chastain asked all the moms to join their children on the turf to juggle the soccer ball. Later, when we were getting our pictures taken, she asked me if I had played before. Yeah, Brandi Chastain wants me on the Olympic team! noticed that I could juggle the ball. 4. Speaking of Brandi, can I just tell you how awesomely patient she was with all those little rugrats? She was. And she had fun with them. My boyz aren't soccer players but they loved being able to do this. She and I were able to have a casual conversation about how fast time flies and about how her oldest son is now taller than her and is SHAVING. She advised me to treasure the moments with my boys pre-puberty and pre-hormones. 6. That I was naive enough to actually bring a BOOK on this trip. A book! Like I would have time to read! Silly me! My train time was spent supervising homework, or denying requests for snacks from the snack car, or okaying trips to the bathroom, or refereeing spats over who was gonna play with what electronic device. Then, at night in the hotel room, we all went to bed at the same time. 7. That Eldest and Middle really are great travelers. Eldest was cautious and a big helper with corraling his brothers in the big city. Middle is a space cadet in LaLa land. Baby? Notsomuch. 2 words: HIGH MAINTENANCE. He wants wants wants. He needs needs needs. My youngest? Is tiring, man. 7a. Aside from being tiring and acting 6 going on 16, Baby is also still...my baby. Part of the issue is that we forget that he's still only 6 because he acts so tough. All 3 boyz wanted to go to the big ToysRUs in Times Square. Middle and Baby wanted to ride the ferris wheel. Guess who got to the top of the ferris wheel and wanted off RIGHT NOW?! Notice the lone dirty tear streak? 8. That my illusions of having real New York-style pizza and fresh New York bagels were mere fantasy. Whilst traveling with 3 kids? It was Sbarro pizza, McD's for breakfast and Krispy Kremes in Penn Station. So sad. 9. That the Naked Cowboy who roams Times Square in nothing but tighty-whities and a guitar is a huDge source of amusement for 3 boyz. I didn't take any pictures of him, but trust me, Eldest probably took about 20 with his iTouch. 10. That no matter how frustrated I got at times when traveling solo with the 3 of them, it was a grand experience. The boyz loved New York City. So thank you to Electrolux and the awesome team at Weber Shandwick for the great memories!